How much does it costs to run a computer? > Computing>How much does it costs to run a computer? We have compared 4 PC and their consumption, to see how much money we spend on electricity. The proofs are quite simple and we only need a tester which can measure amperes in the alternate current. You can measure the electricity consumption of your own PC and draw a conclusion of your own. Although, you have to be very careful and prevent electric shock. The proof consists of measuring the amperes of alternate current which our PC consumes in four different situations. We won’t consider the potency factor. Turned off but plugged in. Turned on but without us working on it. Turned on with a 50% charge. Turned on with a full charge. 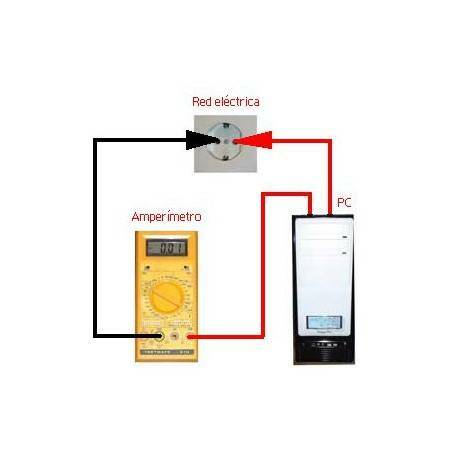 The scheme is the one you see on the illustration, and it consists of placing tester between one of the power cables and the socket. 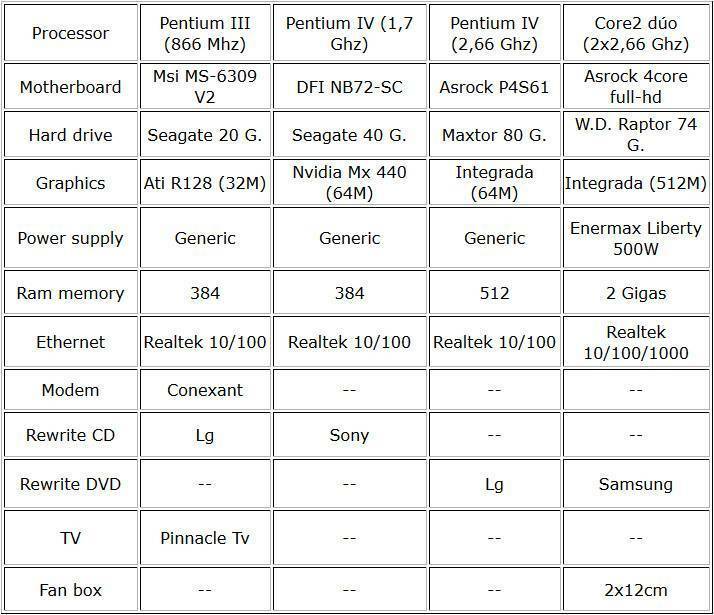 The PC we are going to measure are the ones that appear in the below table. Each PC has its own configuration and we can’t compare the consumption in equal conditions. However, this is not a deciding factor, since, for example, a Pentium III TV card consumes only 2,4 mA. * The PC tower, of Core2 dual is a Tacens Tango Pro, which has a constantly empowered display, and from there we control the PC functions. 1-What is the power we are spending? 2-How much does this power cost us? We know that the power in watts equals a power multiplied by consumption (P=Vx1). The power is measured in watts, the tension in volts and the current in amperes. Once we have obtained the power we calculate how much power we consume in a day, in a month and in a year. We multiply it by the price of KW. We have calculated it for the 4 measure situations: simply plugged in, resting, 50% charge and 100% charge. A day: 10,538 x 24 = 252,912 watts / day. A month: 252,912 x 30 = 7587,36 watts / month. A year: 7587,36 x 12 = 91048,32 watts/ year. A day: 0,252912 x 0,089868 = 0,0227 euros. A month: 0,0227 x 30 = 0,681 euros. A year: 0,681 x 12 = 8,172 euros. 1-We didn’t consider the potency factor. 2-Obviosly, these are simply guiding calculations of what power a PC might spend, and they depend of the cards, fans etc. (of what we have turned on and functioning). 3-It goes without saying that the monitor, which is also an important part of the final consumption of the “complete” PC was not considered. 4-We suppose that the electric power is between 220-230 volts. 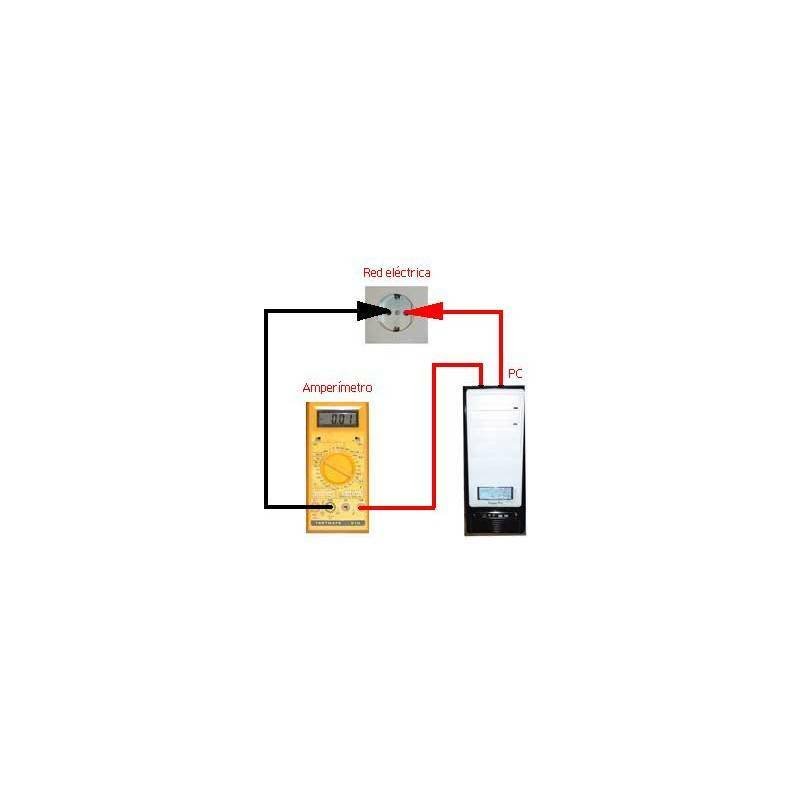 If you live in the country with other voltage electric current power, you will have to calculate the consumption based on your voltage and your price of Kw/h. 5-Obviously, we didn’t consider the PDV or other potential additions to the electricity price since it also depends of the household and the country you are in. Table 1. Comparison of the expenses in euros, different PC-s in a day. Daily expenses in euros. Table 2.Comparison of the expenses in euros, different PC-s in a month. Monthly expenses in euros. Table 3. Comparison of the expenses in euros, different PC-s in a year. Yearly expenses in euros. Is it a lot, or not, to pay 10.52 euros a year for a PC while merely having it plugged in?. I think it is, but then we can unplug the power cable from the socket every day (what we don’t usually do), if not, we pay the bill and that’s it. And 61,92 euros to have it functioning? Definitely yes, it is a lot. Apart from the fact that turning off the computer when we are not using it saves us some money; it’s also much more “ecological” to do so. Especially now with all the climate changes and what now. We advise you to turn it off when you are not using it.